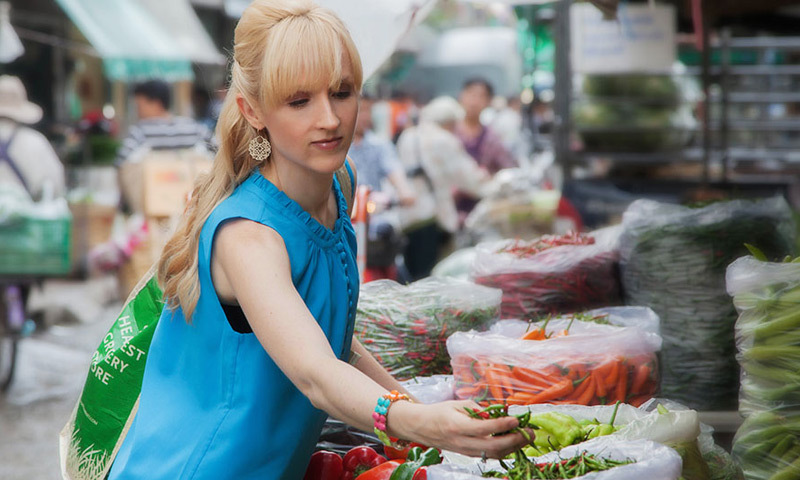 Choose the purchase option that best suits your needs. Creatives rejoice! A simple, professional and responsive WordPress Portfolio Theme for showcasing your talent! Your talent deserves a professional presentation, and the Portfolio Theme is perfect for displaying the visual talents of any creative professional! The clean and minimal design focuses on the imagery. So, visitors will appreciate your artwork to the fullest extent — without distraction. Creating a portfolio website is simple! Gallery pages are created using categories. Simply add a post within the WordPress dashboard, and assign it a category — such as illustration, painting, or design. 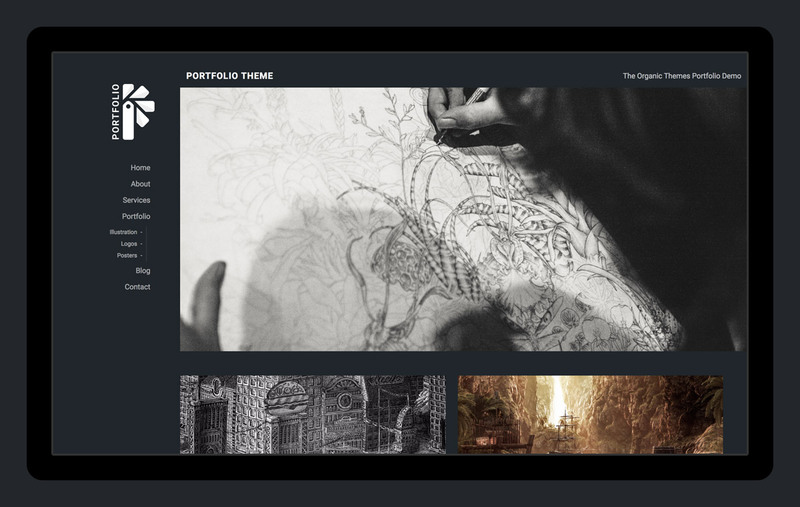 Once you’ve added your artwork as individual posts, you can then display the entire category as its own portfolio. Additionally, unlimited slideshows of your art can be created using page templates. The theme utilizes the intuitive WordPress customizer for changing the options and appearance. As a result, the website setup process is completed within minutes! While the Portfolio Theme features a design that’s minimal in style, the unique layout makes it stand out among other portfolio websites. The vertical website navigation always remains visible — anchored in the same position. Sub-pages within the menu are hidden from display until their parent page is clicked. Also, the navigation style adapts as the screen size changes. So, visitors can reliable navigate your portfolio with ease using any device. Slideshows are centered horizontally and vertically within the browser window. It’s a style that used to be common among Flash portfolio websites. However, as websites transitioned towards better HTML and CSS structures, achieving vertically centered content was a challenge until recently. Now, with widely adopted browser support for CSS flexbox styles, this look can achieved once again. Category pages display a responsive 3-column gallery layout — displaying only the featured image, and a post title when the image is hovered. So, you can create full gallery pages that focus entirely on the imagery. Additionally, the columns decrease with the browser window size for a fully responsive layout. In the case of a portfolio website, the typography should not be a distraction from the imagery. So, the typography throughout the theme is simple and highly legible across all devices. As a result, visitors can focus on the artwork as the priority, and the content secondarily. Sharing your artwork is simple. The social media menu displays within the main navigation menu. So, you can direct visitors to your additional portfolios across other creative social networks such as Behance, Dribbble or Deviant Art. In addition, the theme is compatible with the WordPress Jetpack plugin. 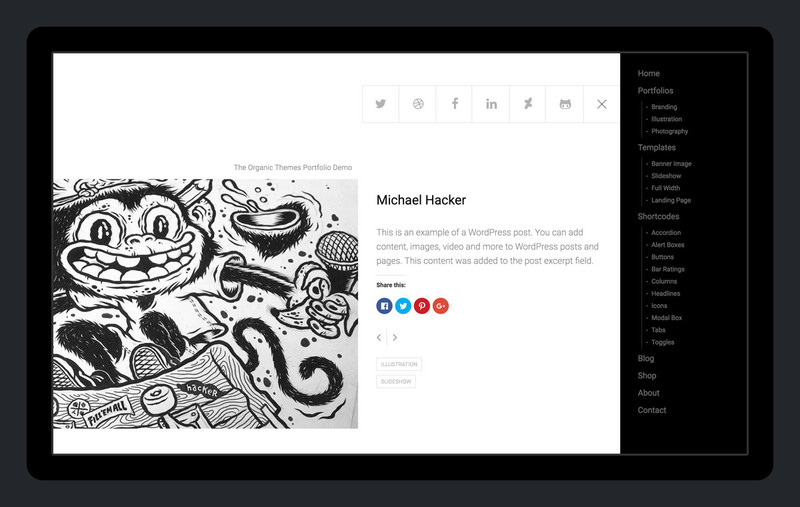 The Jetpack sharing module is perfect for promoting your work. Potential clients and customers will be viewing your portfolio website on their phones. As a result, your portfolio should make a great impression across any device or screen size. 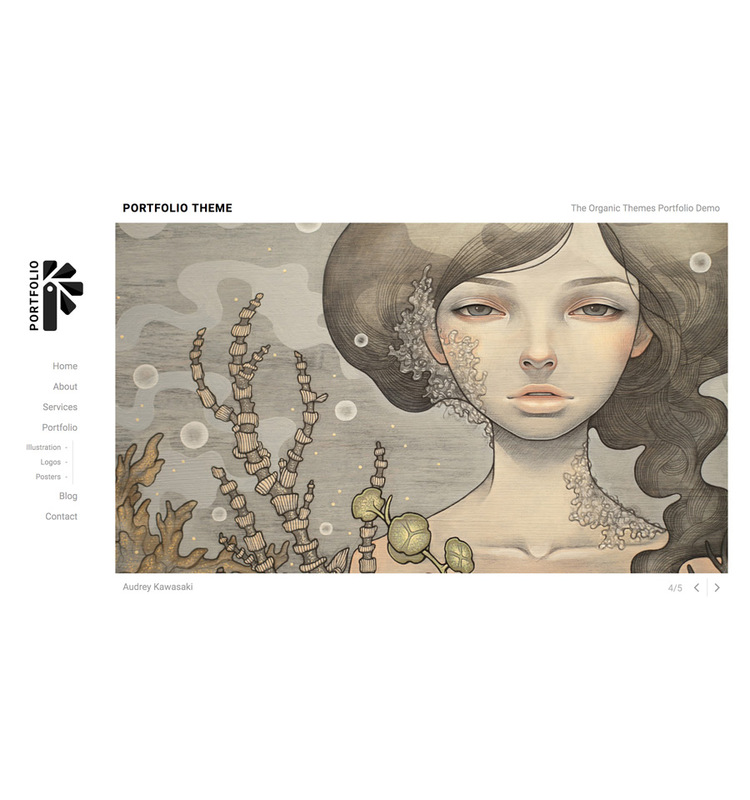 The responsive framework for the Portfolio Theme ensures that visitors will view and browse your work with ease. 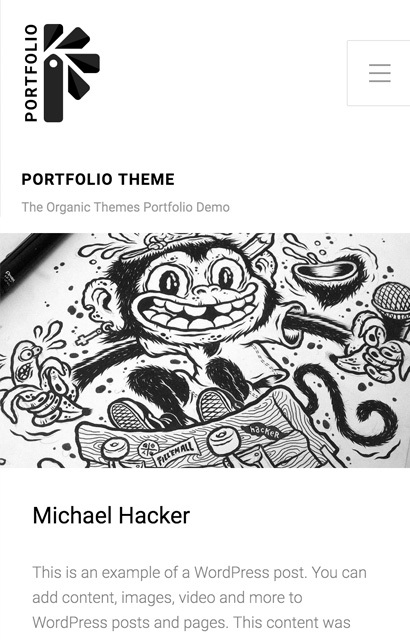 Why Upgrade To The Portfolio Theme? 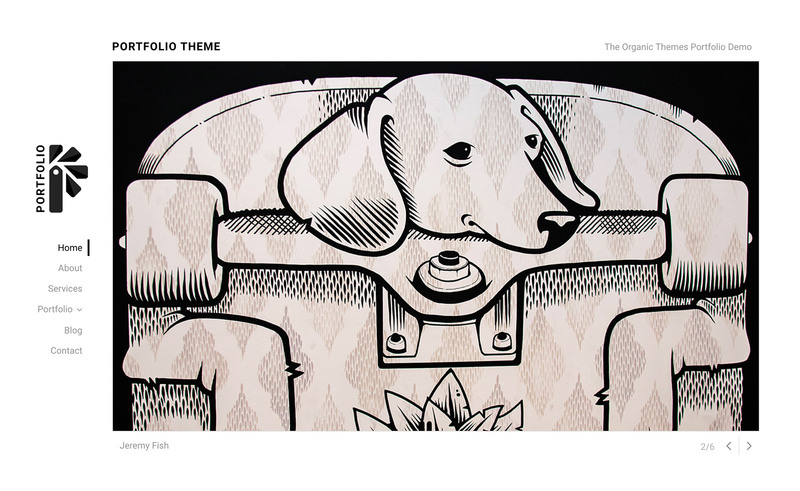 The Portfolio Theme integrates seamlessly with the popular WooCommerce plugin. So, you can create an online shop to sell your artwork, designs, and crafts. Several options for changing link, button, and background colors are included within the theme. Color changes are viewed in real-time within the customizer. Home Slideshow – A featured content slideshow template. Project Slideshow – A slideshow of Projects from the Jetpack Portfolio custom post type. Landing Page – An “Under Construction” page template that can be used while building your site. Testimonials – A page for displaying client testimonials. Portfolio – A portfolio page template for displaying multiple categories. The theme features an option to collapse sub menus. The sub menus are expanded by clicking the parent link. As a result, you can add several sub menu links while maintaining a minimal menu. Setup your site like the theme demo using the One Click Demo Import plugin. Then, use the content as a guide to build your website. Purchase the premium version to gain access to our extensive technical support forums, helpful support team, documentation, and tutorials that are unavailable to Portfolio Lite users. Categories display in a clean gallery layout. Change the background to any color, and your content will still be visible. The theme features a slide-out menu and social media menu. This theme is created for self-hosted WordPress websites. If you have a WordPress.COM blog, you will need to purchase the theme from WordPress.com, or have the theme hosted. 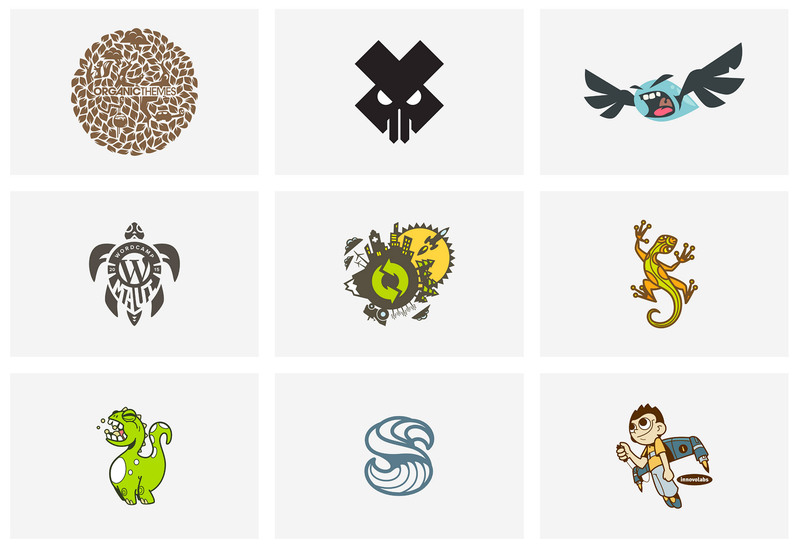 Customers that have built awesome WordPress websites using the Portfolio Theme. 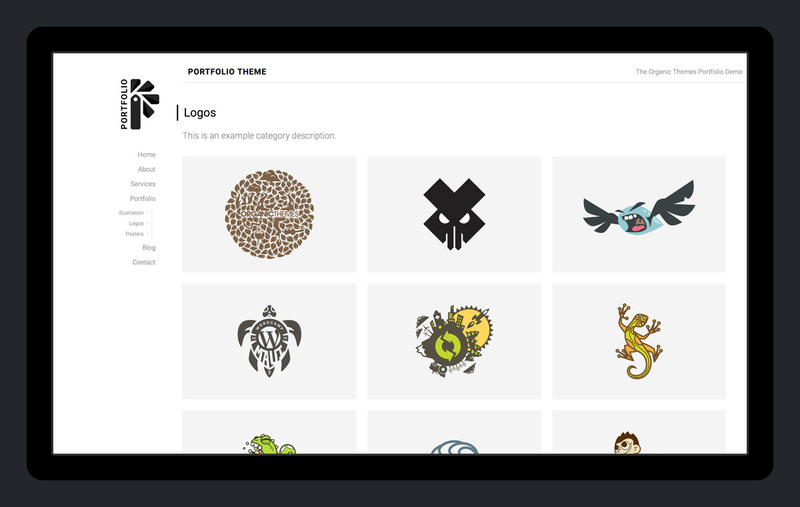 Start building your website with the Portfolio Theme! With our Theme Setup service we'll manually install WordPress, your Organic Theme and some essential plugins. In addition, we'll install demo content, setup your theme options, upload your logo, change the background and more!